There are mortgage loan limits set on the various mortgage loan programs. The Gustan Cho Team now offers non-qm jumbo mortgages for self-employed borrowers with credit scores as low as 620. No income tax returns are required. 10% to 20% down payment. Amount of down payment required depends on borrowers credit scores. How we calculate income is averaging 24 months of bank statement deposits and that monthly average is the borrower’s monthly income. Withdrawals do not matter and do not count. Up to 50% debt to income ratios. Now self-employed borrowers who have a lot of write offs on their tax returns can qualify for non-qm jumbo mortgages with no tax returns. Jumbo Mortgages are residential mortgage loans that fall over the maximum lending limits set by FHFA. It is called non conforming loans since it does not conform to the government’s maximum lending limit. Conforming loan limits set by Fannie Mae and Freddie Mac for 2019 is capped at $484,350 on counties that are not classified as high-cost areas. Non-QM Mortgages has much more lenient lending guidelines than traditional jumbo loans. Jumbo Mortgages have tougher mortgage lending criteria than conventional mortgage loans. There is no waiting period after foreclosure, deed in lieu of foreclosure, short sale to qualify for NON-QM Jumbo Mortgages. Borrowers with 620 credit scores can qualify for non-qm jumbo mortgages where traditional jumbo lenders want 700 credit scores. 10% to 20% down payment is required on jumbo non-qm jumbo mortgages where most traditional jumbo lenders want 20% to 25% down payment. 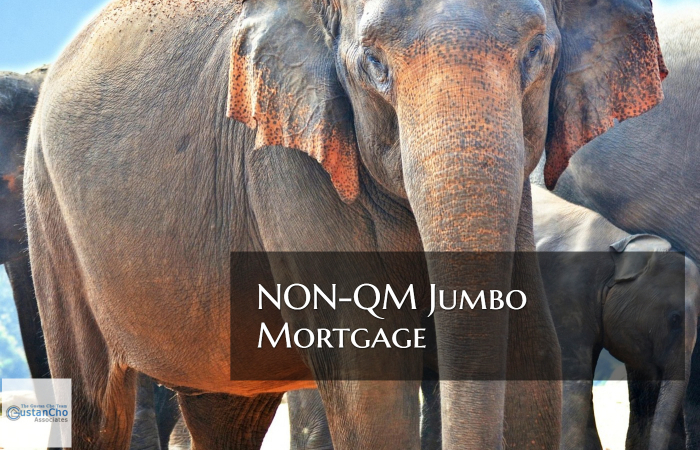 There is no mortgage insurance required on jumbo non-qm jumbo mortgages even with higher than 80% loan to value. We now offer a 10% down payment, 90% loan to value, with no private mortgage insurance required to qualified borrowers. Non-QM Mortgages for self-employed borrowers is a special jumbo loan program where no tax returns are required. 24 months of bank statement deposits are averaged and the monthly deposits are used as monthly income. Borrowers can use personal and/or business bank statements. 100% of deposits can be used on personal bank statements. 50% of deposits are used on business bank statements. Needs to be from the same bank account and multiple bank statements are not allowed. Overdrafts are not allowed. An alternative to Jumbo mortgage loans is the 80/10/10 mortgage loan program. This is where the home buyer who wants to purchase a higher priced home that exceeds the $484,350 conforming limit caps can get a first conventional loan and get a second mortgage. Home Buyers interested in qualifying for NON-QM Jumbo Mortgages, please contact The Gustan Cho Team at 262-716-8151 or text us for faster response. Or email us at gcho@loancabin.com. We are available 7 days a week, evenings, weekends, and holidays.